Under new ownership and with a new head coach and general manager in Joe Kuharich, the Philadelphia Eagles were very active in trade activity following the 1963 NFL season. They had already swung controversial deals involving two key performers on offense, flanker Tommy McDonald and QB Sonny Jurgensen, and on April 10, 1964 they traded OT J.D. Smith to the Detroit Lions for DT Floyd Peters and HB Ollie Matson. Having won the 1960 NFL Championship and contending in ’61, Philadelphia was most recently coming off of back-to-back last place finishes in the Eastern Conference. Injuries were a major problem, with the team winning just five of 28 games, along with three ties, over the course of the 1962 and ’63 seasons. Beyond the injuries, the pass-oriented offense didn’t run the ball particularly well, with the exception of star all-purpose HB Timmy Brown, and the defense lacked a good pass rush. The Lions also suffered through an injury-plagued 1963 season, dropping to 5-8-1 after having placed second in the Western Conference for three years in a row. Detroit was long known as a strong defensive team with a less impressive offense. Floyd Peters (pictured above), who was a month short of his 28th birthday, was the key player in the deal for Philadelphia. An eighth-round draft choice out of San Francisco State by the Colts in 1958, he failed to make the team that year but was picked up by the Cleveland Browns in ’59. 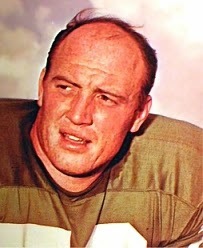 Following three seasons in Cleveland, Peters was obtained by the Lions in 1963 to fill in for the suspended Alex Karras. It was anticipated that the 6’4”, 255-pound veteran would be a valuable addition to a weak defensive line. Thrown in to the deal was Ollie Matson, once a top-flight performer but now 33 years old (he turned 34 a few weeks later) and coming off an injury-plagued year with the Lions in which he ran for just 20 yards on 13 carries. He had a history with Kuharich, who had been his coach when he starred with the undefeated 1951 Univ. of San Francisco team. A first-round draft choice of the Chicago Cardinals (where Kuharich also became the head coach), he flashed his all-around skills as a running back, kick returner, and occasional defensive back who earned consensus first-team All-NFL honors in four consecutive seasons (he missed 1953 due to military duty) and six straight Pro Bowl appearances. The Rams traded nine players to obtain him in 1959, but after rushing for 863 yards his first year in LA, his career went into decline, along with the team in general. Under Head Coach Bob Waterfield, he was shifted to safety on defense as well as slot back and fullback on offense, and spent substantial time on the bench in ’62 before being dealt to Detroit. The 6’2”, 210-pound Matson was certainly versatile, although there were concerns about how much of his great talent remained. As for the Lions, they hoped that the 27-year-old J.D. Smith could take over the spot at right tackle vacated by the untimely death of Lucien Reeberg, a promising 1963 rookie. Smith had started for the 1960 NFL Championship team and was named to the Pro Bowl in ’61, but a broken leg suffered in the Playoff Bowl following that season had led to a decline. For Philadelphia, the result of all of the retooling was an improvement to 6-8 in 1964, but the club had just one winning season during Kuharich’s five-year tenure. Unlike other trades he engineered, the acquisition of Peters and Matson in exchange for Smith was one in which the Eagles clearly benefited most. Peters did indeed move directly into the starting lineup and spent six years with the Eagles. 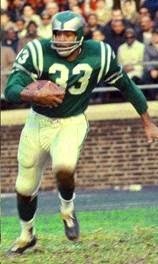 He achieved Pro Bowl honors in 1964 and again, following knee surgery after the 1965 season, in 1966 and ’67 and was a first-team All-Eastern Conference choice by The Sporting News in each of those three years as well. Peters proved to be a formidable pass rusher from the inside of the line who was also tough against the run. While he didn’t get opportunities to perform in the offseason with the mediocre Eagles, he did excel in the 1967 Pro Bowl, in which he was named Most Valuable Lineman. Following his retirement in 1970, after one year with Washington, Peters went on to a coaching career and was a well-regarded defensive coordinator with several NFL teams. Matson (pictured at left) proved to be a valuable reserve halfback. When Timmy Brown went down with an injury in ‘64, he rushed for 100 yards against the Giants and had 85 yards on 11 carries vs. Washington. He totaled 404 yards for the year, his highest since 1959, while averaging 4.2 yards per carry and catching 17 passes for another 242 yards. Matson played another two seasons with Philadelphia and continued to perform well off the bench, and also returned kickoffs. He added 1567 yards to his career all-purpose yards total of 12,799 while with the Eagles and was inducted into the Pro Football Hall of Fame in 1972 (Joe Kuharich was his presenter). Meanwhile, Smith failed to return to form with Detroit, playing in seven games in 1964, missing all of ’65, and finishing his injury-plagued career in 1966.